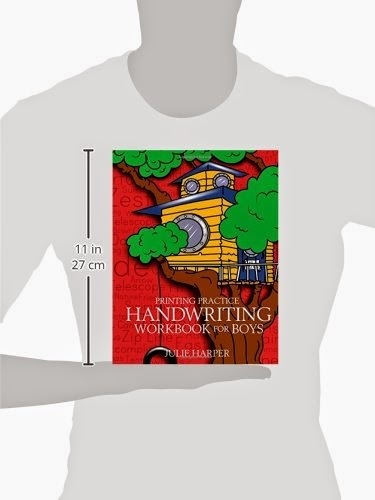 Chance to Win Printing Practice Workbook for Boys! Julie Harper has paid for all prizes, sales tax, and shipping. Entry requires an Amazon.com account. Amazon will ship prizes to winners. Your account information is not shared with Julie Harper, except winners' names may be made public. Amazon is not a sponsor of this promotion. NO PURCHASE NECESSARY. Every 250th eligible entry will win, up to 2 winners. This giveaway started Mar 15, 2015 6:44 PM PDT and ends the earlier of Mar 22, 2015 11:59 PM PDT or when all prizes have been awarded. Printing Practice Handwriting Workbook for Boys is designed to inspire boys’ interest in learning and practicing to print writing phrases and sentences by hand. Boys enjoy reading phrases like, “No girls allowed,” or, “Spy games are fun,” and sentences like, “Meet me at the secret clubhouse,” or “It would be so cool to have super powers.” Exercises like these help to make learning fun, whether in the classroom or at home. Students first trace and then copy words and short phrases in Part 1. There are longer phrases and short sentences in Part 2. Students trace and then copy the words. Part 3 advances onto copying sentences without any tracing. Part 4 challenges students to write their own expressions in response to writing exercises. May your students or children improve their handwriting skills and enjoy reading and writing these phrases and sentences.